Here’s Ralf from KRASHKARMA showing us how he uses Automation tracks in Studio One to send MIDI Control Change messages to his Kemper Profiler amp. This allows him to automate his pedal changes, solo volume, and whammy/wah effects—all synchronized to the song since the band plays to a click track. Great stuff, thanks Ralf! UPDATE 6/15/15—Stefan has created a version of this song that is compatible with Studio One 3. You can get it by clicking here. 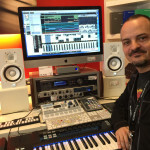 PreSonus: Thanks for taking the time to talk to us, Stefan. Tell us a little about yourself and your history in the music business. Stefan Kengen: The pleasure is all mine. I’ve been active in the music industry for over two decades as a sales rep in both retail and wholesale, education, production and songwriting. I co-wrote and produced a bunch of Euro-Dance and Pop albums in the 90’s and early 00’s, but these days it’s more about having fun and helping others realize their musical dreams than the pursuit of personal stardom. P: How did you first come into contact with Studio One? SK: When Studio One was initially launched a few people in Denmark raised an eyebrow including myself. Most people went “Really? Another DAW?” But with the advent of version 2, and big stars like Teddy Reilly raving about it, people started giving it a shot and in a very short period of time, Studio One has become a household name around here. P: What are the primary reasons for this in your opinion? SK: Besides the obvious focus on more promotion and a very competitive price point, the overarching reason in my view is the ease of use despite the high level of complexity. The work flow is very fast and efficient. I come from Cubase and I felt at home in Studio One immediately. This is not just because the guys behind it are also some of the original Cubase programmers—We have Pro Tools and Logic customers in the store who feel the same way. I think the designers have succeeded in taking the essence of what makes each of the other great DAWs out there good and combined that into one, sleek and elegant package. But besides that, what continues to blow me away is the sound quality of the audio engine. I know there’s a lot of subjectivity involved, but I can honestly say that my mixes sound much tighter, more leveled and punchier in Studio One than they ever did in any other DAW I have worked with. I think it has a lot to do with the quality of the stock plugs and the 64 bit float summing. Everybody basically needs three types of good-sounding processors: Dynamics, EQ and Reverb. The Studio One Compressor, Pro EQ, Open AIR and Room Reverb all sound absolutely amazing, and even the scaled down versions in the entry-level Studio One Artist-version are very good compared to the competition. P: You use a lot of RedLight Dist, Pro EQ, automation and side-chaining in your track. Can you talk a little about how you built the mix and what you used? SK: I made the track to showcase how well the aforementioned important plug-ins, as well as the free content, sound in Studio One. You can talk about something all day long, but in the end a live sound demo in the store makes much more sense to any potential customer. So I make heavy use of the Pro EQ, not just as an individual channel EQ, but also as a master filter. It is so smooth and transparent, that you can make really cool lo/hi cut sweeps and even resonating effects that simply sound awful with most other digital EQ’s. And because it is literally a breeze to automate any parameter in Studio One, it just begs to be played with and taken to the extreme. It can be difficult in other DAWs to set up side-chaining, but in Studio One it’s very simple and almost self-evident. I love the fact that all the dynamics plugins have a side-chain button and the Studio One (Producer/Professional) Compressor is a real jack of all trades. I can almost always get it to respond in a musical way when doing that typical 4 on 4 ducking effect that is so popular these days. It may seem trivial, but this can be a real pain to get right in other DAWS, unless you add expensive 3rd party compressors. This effect is very obvious on the Bass and Chords tracks in the song, whose side-chained Compressors are triggered by the kick. It’s great to have a pro level impulse response reverb plug in the form of OpenAIR, but I must admit that the quality of the algorithm based Room Reverb has me picking up my jaw from off of the floor every time I use it. Not only can it do those long, never ending, lush caverns you normally need an expensive Lexicon for, it can also do those real tight, almost undetectable room placements that very few plugins can without sounding like a bad chorus effect. The only thing I sometimes miss in it is some modulation options, but then I think about how easily I can just automate e.g. the ‘Population’ and ‘Plane’ parameters with some random LFO curves and presto! Instant luxury! The RedLight Distortion is another stroke of genius in my view. It’s a really useful coloration tool when you want to add some beef or grit to stale sounds, and it can be made to scream your ears off without sounding digital, unless you want it to. Unlike many other distortion plugs, the RedLight Distortion always sounds very rich and powerful and all of the different distortion algorithms have their uses. I use it on many tracks in the song, with both subtle and more extreme settings. In the build-up towards the outtro I dial in some Ampire, which is also very good at making things messy in a cool way. In Studio One I never have to worry about mono/stereo operation of plugins, and I’ve never experienced any phasing issues either, which can sometimes occur in other DAWS when you get overly creative. P: Thanks a lot for your input and thanks again for sharing your song and your thoughts on Studio One. RobScallon over on YouTube just posted this killer video of Metallica’s “Enter Sandman.” In it, the ode to boogymen is performed backwards and recording—which is then flipped again when the video is run in reverse. The perplexing result is that the song comes out forwards while sounding backwards. If that doesn’t make sense, just watch the video and you’ll get the drift. And watch fast for Studio One! Studio One Production Tips from @Groove3—construct a full song from the bottom up! Groove3 has a great new series chock full of Studio One production tips. This five-video series looks at song construction from the bottom up, starting with drums, moving on to bass and guitars, and finally vocals and polishing the final mix. It’s a must-watch: there’s great stuff in here for newbies and some great refreshers and cool ideas for seasoned vets. Check out http://www.Groove3.com for more incredible tutorials! Adrianne Gonzalez (AKA AG) is a highly accomplished musician, songwriter and producer who lives in Los Angeles. She has recently tried out Studio One, and after a short time with it she has officially made the jump from Pro Tools—and doesn’t seem to be looking back. She put together this great video on why she decided to stick with Studio One, and I think the world is better for it. Thanks AG, this is much appreciated! Hemos tenido la chance de intercambiar algunos e-mails con Abraham para obtener algunos detalles adicionales. Como Abraham ha estado usando Studio One—y otros productos PreSonus—por algunos años hasta la actualidad, este es su primer Grammy Latino obtenido como galardón por un proyecto mezclado en Studio One. Abraham llegó a Studio One de la misma forma que muchos usuarios—a través del hardware PreSonus. “Ahora uso Studio One exclusivamente para todas mis mezclas en mi estudio de mezclas personal AMmix”. Martínez continúa, “También lo usamos en nuestra iglesia para grabar y mezclar nuestras obras. Lo que me atrajo principalmente hacia Studio One es que el flujo de trabajo es muy intuitivo. Se sintió natural de inmediato, sobre todo para la mezcla. Recuerdo que tuve que volver a mi viejo DAW para terminar un proyecto antiguo y lo comencé a odiar ya que se sentía primitivo en comparación. Lo que me mantuvo trabajando en Studio One, sin embargo, fue su calidad de audio y sus características profesionales. Eso es algo a lo que yo no estaba dispuesto a renunciar”. “Studio One no defrauda”, afirma Martínez. “Las funciones de edición de percusión y de cuantización son las mejores por lejos. Me encanta que nunca hay problemas con clics y pops y todo permanece perfectamente en fase. La calidad del sonido y facilidad de uso son las fortalezas de Studio One”. Martínez habla desde la experiencia cuando compara Studio One con otros DAWs y flujos de trabajo. La Carta Perfecta – En Vivo was a big record for Danilo Montero in 2014—so big, in fact, that it won a Latin Grammy for Best Christian Album. The live album was mixed by Abraham Martinez, pictured above, in Studio One Professional 2. We had the chance for an e-mail exchange with Abraham to get some additional details. 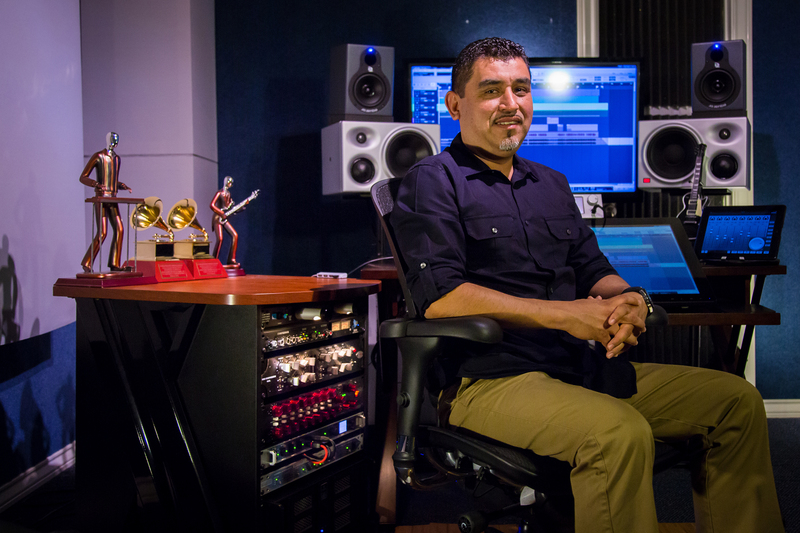 While Abraham has been using Studio One—and other PreSonus gear—for a couple of years now, this is his first Latin Grammy award for a project mixed in Studio One. 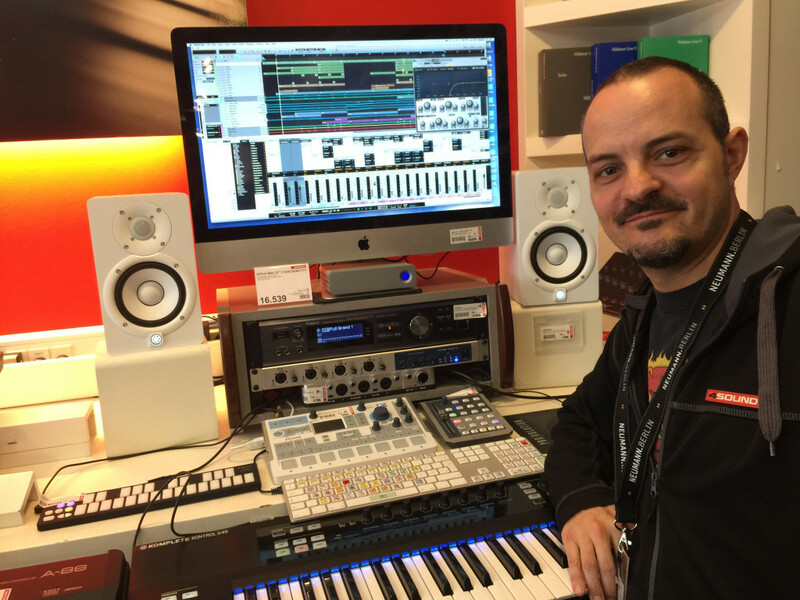 Abraham came into the Studio One fold the same way many users do—via PreSonus hardware. “Back when I recorded more, I used an an M80 preamp and ACP88,” says Martinez. “More recently I’ve used an ADL 600 for tracking vocals and bass. I also use a StudioLive mixer for its audio quality and ease of use for work on our church campus. I have always associated PreSonus with value, but had never considered them a serious DAW developer until I tried Studio One! “Now I use Studio One for exclusively for all of my mixes in my personal mixing studio, AMmix,” Martinez continues. “We also use it at our church to to record and mix our plays. The main thing that drew me toward Studio One was it’s incredibly intuitive workflow. It felt natural immediately, especially for mixing. I remember having to go back to my old DAW to finish an older project and hating it as it felt primitive in comparison. What kept me working in Studio One however, was its audio quality and professional features. That is something I just wasn’t willing to give up. “Studio One doesn’t disappoint,” Martinez asserts. “The drum editing and quantization features are the best by far. I love that there are never problems with clicks and pops and everything stays perfectly in phase. Audio quality and ease of use are Studio One’s strengths. Martinez speaks from experience when comparing Studio One to other DAWs and workflows. “I can’t wait to see what Studio One has in store for us in version 3,” he muses. 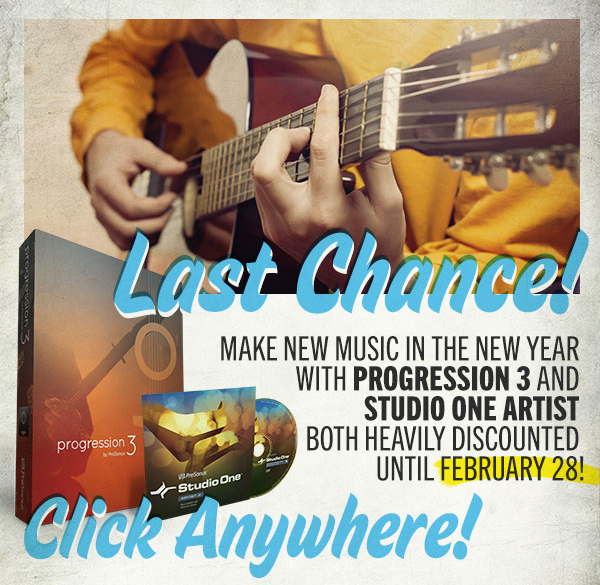 Hurry, LAST CHANCE to Save Big on Progression 3 and Studio One Artist! Hurry, this great offer ends February 28! Click here to get Studio One Artist and/or Progression 3 for just $20.15 (USD) each! If you’re not in the USA, that’s OK—monster discounts are available globally. Get your song on for less money than you even thought was possible! Click here to save on Studio One Artist and Progression 3 at our online store. To learn more about Studio One, click here. To learn more about Progression 3, click here. Once in a while we get a request for a tape stop effect in Studio One. Fact is, you can do this by automating the pitch control in SampleOne to achieve the exact same effect! Alex from Wiz Produxions put together this excellent demo showing how its done. Thanks Alex!